Many Native Americans suffer from diabetes, high blood pressure, obesity, and other health conditions that could be prevented or improved with a healthy diet. Yet, fresh produce is often difficult to buy in these remote reservation communities. Many are an hour or more from the nearest grocery stores, so the only locally available food is usually convenience-store fare. How can tribal members eat healthy and nutritious meals under these conditions? The popular NPRA Project Grow service offers one good solution: Give people the means to provide for themselves by growing their own vegetables. NPRA Project Grow does even more than help plant corn and beans. It also brings communities closer together and helps our partners, their volunteers and participants reinforce traditional Native American cultures. Gardeners gain a sense of accomplishment and a connection to traditional ways. Project Grow encourages self-sufficiency by tilling garden sites for interested residents on several reservations in the Northern Plains. NPRA then provides a variety of vegetable seeds plus supplies for tending the gardens (for partners who request them) such as work gloves, hats, and sunscreen. 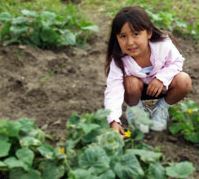 The fresh produce grown by Project Grow gardeners helps Native American families eat healthier foods and also save money on food bills. This allows them to stretch their family budgets to cover other necessities. Gardening also promotes healthy outdoor exercise. Project Grow offers assistance while honoring the proud heritage of Native Americans. Growing crops was once an important tribal activity and many Elders remember a time when tending gardens occupied much of each day. Our garden service allows participants to maintain this connection with the Earth and the four seasons. 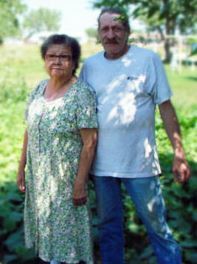 Perhaps equally important, raising one's own food offers a sense of accomplishment that is often difficult to realize on the impoverished reservations of the Northern Plains. Community gardens are offered as well. These gardens share their produce with the community members as they determine appropriate. "Project Grow evokes nostalgic memories to many of our Elders, of times when they did plant their own gardens. Our youth have also learned valuable lessons by this garden project."